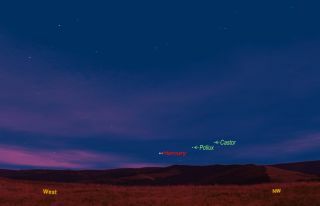 This sky map shows the location of Mercury just above the horizon on June 30, 2011 at about 9 pm Local Time in mid-northern latitudes, weather permitting. The planet Mercury is often cited as the most difficult of the five bright planets to see, but this week is one of the best times to try to spot the small, rocky world in the dark sky. Mercury is known as an "inferior planet" because its orbit is nearer to the sun than the Earth's. The planet always appears, from our vantage point, to be in the same general direction as the sun and it is usually lost in the sunlight. But Mercury is not really that hard to see. You simply must know when and where to look, and find a clear horizon. A series of promising Mercury skywatching opportunities, weather permitting, will begin on Thursday (June 30). Three times each year this rocky, little world emerges into the evening twilight for a few weeks and at three other times in the year it ventures a little way into the morning sky. Yet, even at these greatest elongations it can't be easily seen unless other conditions are favorable. It is important, for instance, that Mercury be positioned as nearly directly above the sun's position in the sky as possible. This condition is best fulfilled just after sunset in the late winter or early spring, and before sunrise in late summer or early autumn. For skywatchers in the Northern Hemisphere, a fine window of opportunity for viewing Mercury in the evening sky is about to open up. That window, in fact, will open on June 30 and will remain open through at least July 13, giving you an ample number of chances to see this so-called "elusive planet" with your own eyes. Mercury recently departed the morning sky, after finishing a set of poor apparitions during the dawns of May just above the east-northeast horizon. It reached superior conjunction behind the sun on June 12, the same day that it arrived at perihelion — the point closest to the sun in its orbit, so the planet moved very quickly into the evening sky. To see Mercury, scan near the bright twilight west-northwest horizon soon after sunset with binoculars. If your sky is clear and there are no tall obstructions to your view (like trees or buildings), you should have no trouble seeing it as a very bright "star" shining with just a trace of a yellowish-orange tinge. On Thursday, look just above the west-northwest horizon about 30 to 40 minutes after sundown for Mercury. The planet will be shining brighter than any other star in an eye-catching line with the twin stars of Gemini, Castor and Pollux. Mercury will appear about 6 degrees to the left of Pollux. Your clenched fist held at arm's length is equal to roughly 10 degrees. In the evenings that follow, Mercury will slowly diminish in brightness, but it will also slowly gain altitude as it gradually moves away from the vicinity of the sun. It should be readily visible through at least July 13, very low above the west-northwest horizon for nearly an hour after sunset. After that, it becomes more difficult to see. This is ironic because on July 20, Mercury will be 27 degrees east of the sun, its easternmost position for the year. But for observers at mid-northern latitudes this is not a very favorable apparition. The farther south you are, the better the Mercury views will be. Seen from the Southern Hemisphere, Mercury offers superb viewing opportunities, with the planet remaining high and visible at dusk all month long. In contrast, as seen from 40 degrees north latitude Mercury appears much lower, and it never gets to shine in a fully dark sky. If you live much farther north than that, you may need binoculars to locate Mercury in the day’s afterglow. Mercury, like Venus, appears to go through phases like the moon. The amount of Mercury's surface lit up by the sun will continue to decrease in the days that follow. So when it begins to turn back toward the sun's direction after July 20, the planet will fade at a rather rapid pace. In old Roman legends, Mercury was the swift-footed messenger of the gods. The planet is well named since it is the closest planet to the sun and the swiftest of the star's planetary family. Mercury averages a speed of about 30 miles per second and making its yearly journey in only 88 Earth days. Interestingly, the time it takes Mercury to rotate once on its axis is 59 days, so its entire surface experiences periods of intense heat and extreme cold. Although Mercury's average distance from the sun is only 36 million miles (57.9 million km), Mercury experiences by far the greatest range of temperatures of the planets: nearly 900 degrees Fahrenheit (482 degrees Celsius) on its day side, with lows of minus 300 F (minus 184 C) on its night side. In the pre-Christian era, this planet actually had two names, as it was not realized it could alternately appear on one side of the sun and then the other. The planet was called Mercury when in the evening sky, but was known as Apollo when it appeared in the morning. It is said that Pythagoras, at about the fifth century B.C., pointed out that they were one and the same.